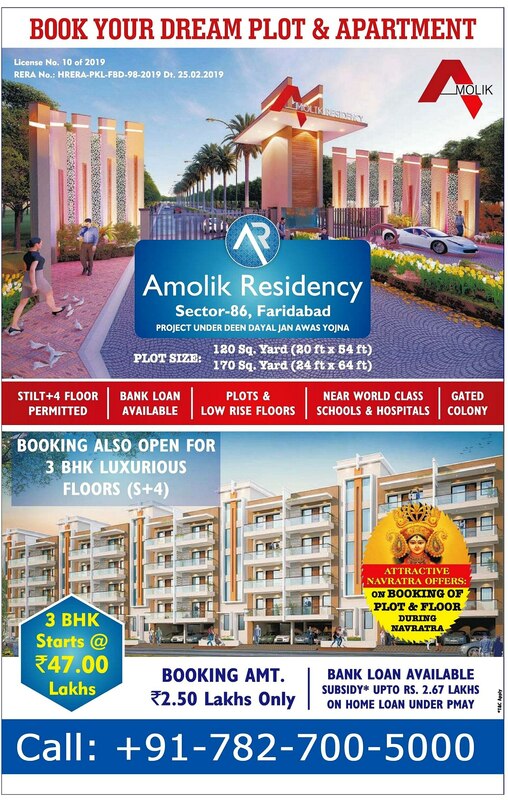 Amolik Residency Sector 86 faridabad Deen Dayal Jan Awas Yojna Affordable Plots & Floors, Sector-86, Faridabad Amolik Residency Plots under | Govt. Deen Dayal Awas Yojna‎ Amolik Housing Sector 88 Faridabad Amolik Heights in Sector 88, Faridabad Flats for Sale in Amolik Heights Faridabad Affordable Housing flats faridabad Amolik Residency is Plotted Township Project launched by Amolik Grup with a mission of providing Luxury Housing at Affordable Price. The project is commenced under Deen Dayal Jan Awas Yojna at Sector-86 Faridabad. With RERA Certification, the project consists of plots and floors of different sizes with complete infrastructural facilities and amenities with easy connectivity With Master Road and Metro. Looking for Residents , Commercial Properties , Shops , Offices in Faridabad or Gurgaon ??? Come to Us , DSG Properties , A Leading Real Estate Agent having various deals of Residential , Commercial, Shops , Offices in Faridabad, Gurgaon , Haryana....Buy 1, 2, 3, 4 BHK Apartments, Studio Apartments, Builder Floors, Society Apartments..